I’d love to guest post on your blog. And I’ll give you a free copy of The Psalms of Asaph: Struggling with Unanswered Prayer, Unfulfilled Promises, and Unpunished Evil! Just right click the book cover below and save it, then copy and paste the following post. Email the link to jim@jameswatkins.com and I’ll send an e-copy. Thanks! But if any of you lacks wisdom, let him ask of God, who gives to all generously and without reproach, and it will be given to him. But he must ask in faith without any doubting, for the one who doubts is like the surf of the sea, driven and tossed by the wind. For that man ought not to expect that he will receive anything from the Lord, being a double-minded man, unstable in all his ways (James 1:5-8). And the Lord—who is the Spirit——makes us more and more like him as we are changed into his glorious image (2 Corinthians 3:18b). Be imitators of God, therefore, as dearly loved children and live a life of love, just as Christ loved us and gave himself up for us as a fragrant offering and sacrifice to God (Ephesians 5:1). 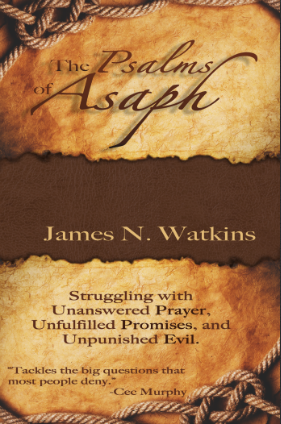 Condensed from The Psalms of Asaph: Struggling with Unanswered Prayer, Unfulfilled Promises, and Unpunished Evil by James N. Watkins..